A new dinosaur-like species has been uncovered from Triassic rocks in Africa – existing 10 million years before the earliest known dinosaur. A full description of the find, which has been named Asilisaurus kongwe, is being published in this week’s Nature. The find encourages the notion that dinosaurs and other close relatives may also have roamed the earth much earlier than previously believed. 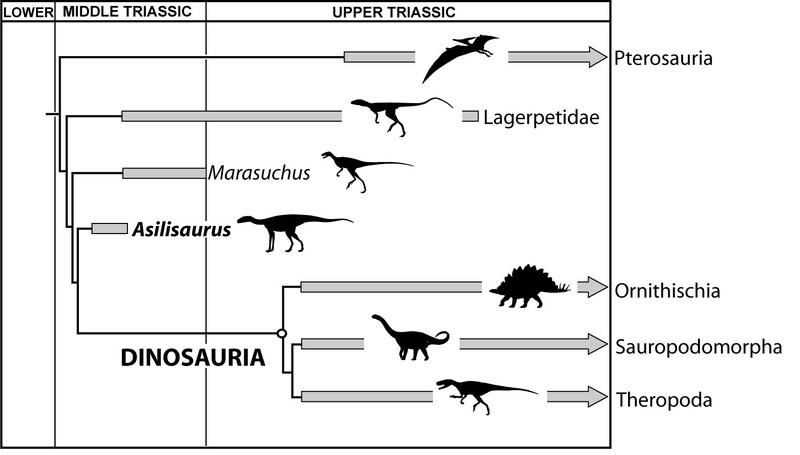 Phylogenetic postion of Asilisaurus among bird-line archosaurs. Picture credit - S. Nesbitt. The new discovery, which would have roamed southern Tanzania 240 million years ago, belongs to a group of species called silesaurs. These creatures are similar to dinosaurs, but do not possess the key characteristics that all dinosaurs have in common – their relationship is equatable to that of chimps and mankind. To date, eight other silesaur species have been uncovered. With the eldest known dinosaurs only 230 million years old, this discovery of a close relative so far back into the Triassic suggests that the divergence between dinosaurs and silesaurs from their common ancestor had already occurred 240 million years ago. 14 individual specimens were discovered from within a single sedimentary bed – from these findings it has been possible for palaeontologists to reconstruct almost one complete skeleton. Asilisaurus appears to have been up to 3 meters (10 feet) long, would have walked on four legs, and was probably either a herbivore or an omnivore.